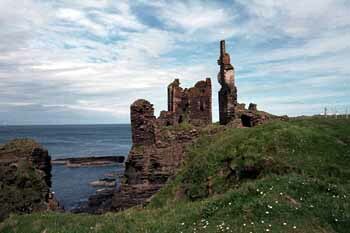 While considered two separate fortresses, Castle Sinclair and Girnigoe Castle share a single site. Not much remains of Castle Sinclair, which lies within the outer courtyard. Girnigoe is basically a 15th century keep and consists of a main block and two wings, in a U-plan. It had a walled courtyard and a gatehouse that spanned the ditch of the promonotory. In 1455, the Sinclair Earls of Orkney were forced to resign the earldom and were given Caithness as compensation. In 1571, the Earl had John , his son and heir, imprisoned in the dungeon of Girnigoe for seven years. The master was fed on salted beed and denied water and died mad. The castle was remodeled in 1642 and a new tower was built in the outer courtyard, often referred to as Castle Sinclair. Cromwell had the castle garrisoned in 1650s. The 6th Earl had huge debts to Campbell of Glenorhy, and the earldom passed to the Campbells to pay them off. The Sinclairs recovered the earldom in 1681. The castle was damaged during the attack and was not reused. It is noted as being abandoned by 1700. The main block is five stories, but the basement level of the main block is lower than that of the wings. The inner court lies on a long stone tower with a sea-inlet (or goe) on the south side. 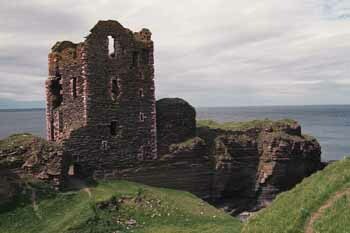 The castle could be approached by a drawbridge over a deep chasm and then via a passage through the north end of the tower. 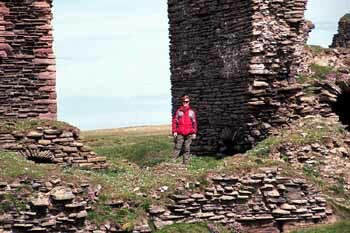 Girnigoe Castle once extended nearly all of the way down the spit of land, but the peninsula has mostly collapsed and is being eroded continually by the tides. There is a faint path, but the ruins and cliffs are considered dangerous and should be avoided.